I love the simplicity of this recipe. This is so simple because it is basically 3 ingredients wrapped up and placed in a crockpot to cook for the day.Since I switched to Paula Deen’s House Seasoning, it has become even simpler. I have prepared the potatoes the night before and threw them in the crock on my way out for the day. It is even easy to increase the number of potatoes and all that the preparer needs to do is make sure the crock can handle all the potatoes! 5) Place in Crockpot and cook on LOW for 8-10 hours. 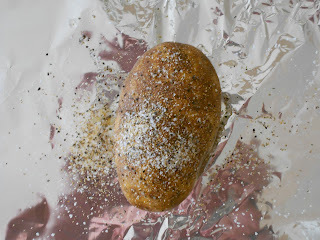 Potatoes are finished when a knife goes through potato easily. 6) Top with your favorite toppings. 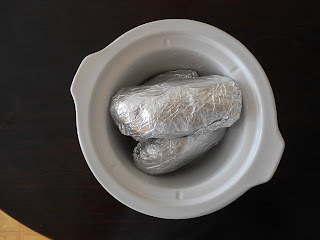 Note: If my potatoes have finished before the rest of my meal, I have been known to take them out of the crockpot and put them in a 170 degree oven until rest of meal is done.